Kristan Higgins is beloved for her heartfelt novels filled with humor and wisdom. Now, she tackles an issue every woman deals with: body image and self-acceptance. For each of them, that means something different. For Marley, it's coming to terms with the survivor's guilt she's carried around since her twin sister's death, which has left her blind to the real chance for romance in her life. 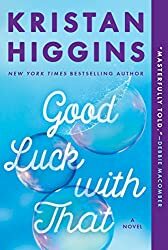 For Georgia, it's about learning to stop trying to live up to her mother's and brother's ridiculous standards, and learning to accept the love her ex-husband has tried to give her.